Household income surveys underestimate income inequality because they fail to capture top incomes. A popular solution is to combine the household survey with data from income tax records, though for countries like Egypt these records are not available, leading to an underestimate of inequality. This column argues that data on house prices can instead be used to estimate the top tail of the income distribution. Using this method the Gini index for urban Egypt increases from a survey-based figure of 0.36, which suggests that it is one of the world’s most equal countries, to 0.47. Official estimates of income and consumption inequality rank Egypt as one of the world’s most equal countries. The estimates are derived from national household surveys that collect detailed income or consumption data for a sample of households, assumed to be representative of the country’s population. To obtain estimates of the Gini coefficient for 135 countries around 2008-09 (the most recent period for which we have survey data for Egypt), we consulted the World Bank PovcalNet, a repository of household income and consumption surveys from around the world (Figure 1). The Gini coefficient is arguably the most commonly used measure of inequality; it ranges between 0 and 1 with higher values indicating more inequality. In this case the most unequal countries are on the left, becoming progressively more equal as we move to the right. Egypt’s Gini is just over 0.3, which is low by international standards. It is even low by the standards of the region, as the highlighted countries show. Note: Countries sorted by Gini index (from highest to lowest inequality). Surveys are within two years of 2008. Source: Authors’ calculations based on PovcalNet and All the Ginis (Milanovic, 2014). The increased level of inequality may not have been the decisive issue in the social unrest that began in 2011, although some argued it might have contributed to it (Ncube and Anyanwu 2012, Hlasny and Verme 2013). Protesters were motivated by both economic and political grievances (Kinninmont 2012, Arampatzi et al. 2015), and many grievances are related to inequality: the deterioration of public education and healthcare, chronic corruption, crony capitalism, police brutality, poor working conditions, low pay, and lack of accountability. Those who can afford it rely increasingly on private education and healthcare which contributes to what van der Weide and Milanovic (2014) refer to as “social separatism”. Post-Mubarak, leading political parties made economic inequality a defining issue in their election manifestos (Kinninmont 2012). So is Egypt's inequality higher than official estimates? Alvaredo and Piketty (2014) conjecture that household surveys underestimate inequality. Such surveys fail to capture top incomes, either due to non-response of the rich or under-reporting of their incomes or both (Atkinson et al. 2011, Alvaredo and Piketty 2014). A popular solution to this problem is to estimate the top tail of the income distribution from income tax record data, then estimate the rest (often 99%) of the income distribution using the household survey, and combine the two (Atkinson et al. 2011, Alvaredo 2011, Alvaredo and Londoño Vélez 2013, Anand and Segal 2015). Income tax records arguably are the ideal source of data, but are usually hard to find. Egypt is no exception, so a re-estimate in this case requires alternative top income predictors. 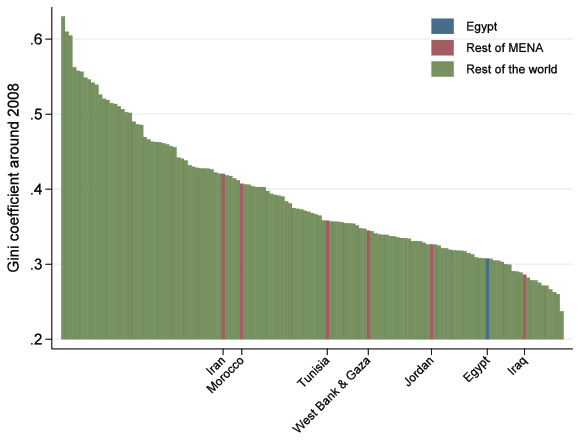 Hlasny and Verme (2013) estimated inequality in Egypt by explicitly modeling the non-response among top income households to re-weight the available observations. This did not yield a meaningful correction, possibly because their approach does not use a second (external) source of data. If the main problem is that top income households are simply missing from the household survey, then no adjustment that relies solely on the survey can resolve the downward bias in estimates of inequality. We instead used data on house prices to estimate the top tail of the income distribution (van der Weide et al. 2016). The house price database was compiled from real estate listings that are available in the public domain. We estimated the relationship between the house price and household income using the household survey. We found evidence that inequality is considerably underestimated in Egypt. Using this method, the Gini coefficient for urban Egypt increases from 0.36 to 0.47. This would move Egypt to the middle of the pack in Figure 1. There are caveats when we rely on predictors like this one. We made assumptions about the functional form of the relationship between the house price and household income, and about the functional form of the upper tail of the house price distribution. In addition, we assumed that one house constitutes one household and that all houses are domestically owned. Therefore, in cases where tax record data are available, these should undoubtedly be considered first. Nevertheless, we believe that this approach will provide more reliable estimates of inequality than estimates obtained using survey data alone. (This is confirmed in a robustness analysis provided in the annex to our research.) The perfect should not be the enemy of the good. Inequality estimates for other countries may also be downward biased. When household surveys are combined with income tax data, the Gini coefficient for the US in 2006 increases from 0.59 to 0.62 (Alvaredo, 2011), for Colombia in 2010 from 0.55 to 0.59 (Alvaredo and Londoño Vélez 2013), and for Korea in 2010 from 0.31 to 0.37 (Kim and Kim, 2013). Where Egypt will ultimately rank in a completely revised version of Figure 1, nobody knows.